Joshuahoeth for original mod inception! A modification of the mod by @Joshuahoeth which you can find here. His mod does not work on the Steam version, so i decided to fix that for my own Steam copy of the game. Then i thought why not upload the mod for anybody that may need it (after kindly asking permission from Joshuahoeth of course). Bullets and shells will remain active in the game world for 900 seconds / 15 minutes with interaction physics fully enabled, instead of almost immediately disappearing after 4 seconds in vanilla game. On my mid-level machine i haven't noticed the slightest FPS change even with 100s of bullets on the floor. In other words, it helps with immersion. 2. Place that folder into a "Mods" folder in the game root directory, eg. 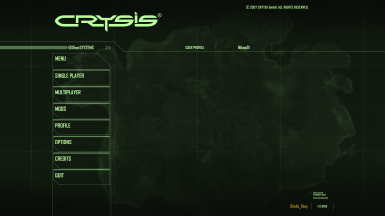 "C:\Steam\SteamApps\common\Crysis". If the "Mods" folder does not exist, then create it. 4. Launch the game from Steam there and enjoy. Tested with latest Steam version, on Windows 8.1 64bit. Also works with other popular mods, such as Tactical Expansion.